The one act plays in this short volume have been enacted in the All India Radio and Television. These mainly deal with the reactions and reflections of ordinary human beings in their day-to-day life. 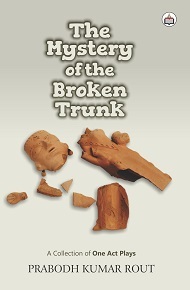 TheMystery of the Broken Trunk is a fine one-act play about the character of a simple idol maker –GovindaMaharana, who while believing in the supernatural power of God, is baffled by the sudden breaking of his idols. The play finally ends when the mystery and suspense are resolved by the actions of a cat who is the ultimate basis of the entire theme of the play. The play has been highly appreciated in the electronic media and was the winner of a national prize in the field of Radio Drama in 1994. The Honey Trap Primary reveals the simple and primitive life of a tribal family with Dungru, the young son of Ghenu and Ilima,as the main character in the play. While projecting the sexual life of a tribal community, the play chiefly deals with the theme of horror and terror of around the infection of the disease, AIDS. The boy suffers from the disease and finally falls a victim to the deadly disease. The play has a strong message about the epidemic for young men and women. The Sinster Design isa satirical play that brings out the simple character of a blacksmith, who with his simplicity and witty nature outwits the great intelligence of the Lord Shiva, by asking him to fulfill his wish, which ultimately makes Yamraj powerless to carry out the order of the Lord. Based on scripture, it is a play that reveals the irony of Lord Shiva and Parvati, who are seen befooled by a simple human character like the blacksmith. The play is full of human feelings and gives an insight into the depiction of the character of great gods and goddesses like Shiva and Parvati. Shri Rout creates a new meaning and understanding of the life of a criminal in his next play The Final Verdict through his portrayal of the character of Ratnakar. A trial prisoner, Ratnakar, who has spent thirteen years in jail is full of remorse and repentance of his crimes. He has refused to ask for pardon, although he deserves mercy for his great and immortal writings.With his dominant will and resolution, he prefers death to life because of his great sense of realization of his crimes. This play is full of irony, exposing the countless characterswho never admit their crimes and the corruption that they commit in society. Shri Prabodh Rout was born on 15 May 1971 in Gapalpur village, in the well-known district of Jagatsinghpur in Coastal Odisha. The eldest son of Shri Dharmandra and Shrimati Pramila, he had a brilliant academic career right from his childhood days. This ultimately helped him achieve higher educational qualifications and to become an officer of the Odisha Administrative Service. An active and energetic bureaucrat, he also has a strong creative urge which has helped him emerge as a creative writer in the fields of short story, poetry and drama. Apart from fine and original pieces of excellent poetic compositions, his plays have been enacted in the All India Radio and on Television. These are also being published in this volume. Shri Prabodh is mainly known as a quiet, creative writer who likes to express the primary human feelings and emotions.